This story is part of a weeklong Yahoo News series marking one year since the opening up of relations between the United States and Cuba. The Internet is slowly coming to Cuba. This year, the country’s telecommunications monopoly ETECSA opened the first of 35 public Wi-Fi hotspots across the country, many of them in Havana, in or near hotels. 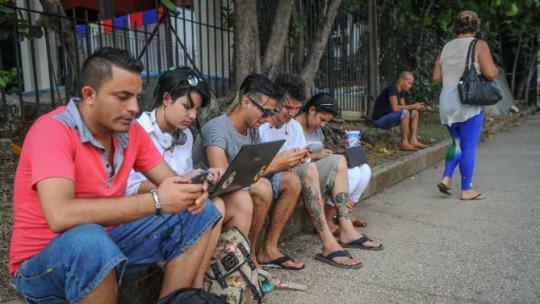 Those Cubans who do have laptops, smartphones, and tablets are lapping it up. “You go outside any hotel that has these Wi-Fi networks and you find 20, 30, 40, 50 people sitting on the ground with a computer or a phone,” says Santiago Zavala, a Mexico City-based partner with venture capital firm 500 Startups; he visited Havana in early November as part of Cuba’s first weekend devoted to startups. Mobile-data access is still more or less nonexistent on the island nation of 11 million, and only about 5 percent to 30 percent of that population has Internet access now, according to Freedom House, a U.S. research and advocacy group. But Internet access is expanding and is increasingly available to Cuban citizens and overseas tourists alike. It also stands to transform Cuba’s economy. But how transformative the Internet and technology in general will be for Cuba is really up to larger forces inside Cuba and overseas. Cubans and tourists typically pay $2 per hour (prorated by the minute) for Wi-Fi access. Those hotspots are capable of speeds of about 1 megabit per second (Mbps), but actual connections can be quite a bit slower because a single Wi-Fi signal might be shared by dozens of people at a time. That $2-per-hour charge represents a significant chunk of the average Cuban’s $20 monthly salary. So you won’t see Cubans wasting their precious online minutes by aimlessly browsing the Web. Rather, they tend to go online with a purpose. Emails are composed offline and website visits are queued up in the browser to connect as quickly as possible. With public Wi-Fi growing, the Cuban government also has plans to expand Internet access at home. Its goal is to see home Internet access reach 50 percent of the population by 2020. That may not be as promising as it sounds, according to Larry Press, a professor of information systems at California State University, Dominguez Hills, who also maintains the blog the Internet in Cuba. That’s because DSL signals degrade over long distances. If a central office is too far away from a person’s house, or the wiring between the home and the central office is too poor, Press says, then the connection will be impossible or incredibly slow. Cuba’s struggles to get online come at the same time that the United States is easing embargo restrictions and renewing diplomatic ties with the country after more than 50 years. That shift is having a couple of different effects. For one thing, Americans can now visit the island nation — if they qualify for a Treasury Department trip license. Those tourists will increase demand for Internet access. The lifting of sanctions also makes it easier for telecommunications and tech companies to do business in Cuba. Sprint signed a direct roaming agreement with ETECSA in November, so now Sprint’s U.S. customers can use their phones in Cuba just as they would at home (albeit at roaming rates). Verizon also offers roaming to its customers visiting Cuba, but it is not a direct roaming agreement with ETECSA. 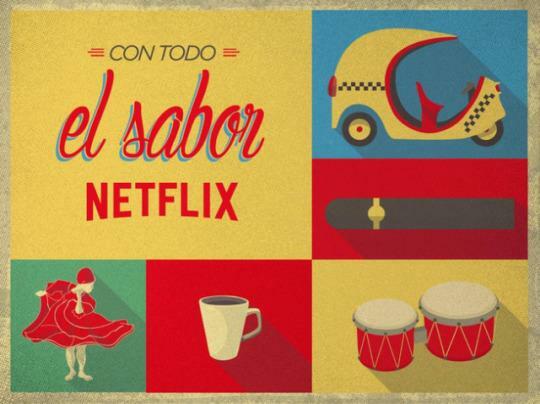 In February, Netflix set up shop in Cuba. It offers its services to any Cuban resident with access to “international payment methods”; unfortunately, the average Cuban would have to spend nearly half his salary just to subscribe. Subscribers from overseas can still access the Cuban catalog during their visits. Another American company hoping to benefit from warming Cuba-U.S. relations is Airbnb. 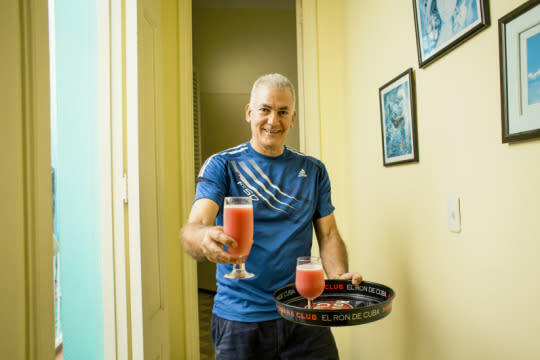 The company is capitalizing on bed and breakfasts — casas particulares — that are already growing in Cuba. Since its debut in April, more than 2,600 hosts among the estimated 8,000-plus casas particulares in Cuba are using Airbnb, the company says. “We anticipate that Cuba could become one of Airbnb’s biggest markets in Latin America,” an Airbnb spokesperson says. The only potential glitch: To comply with current U.S. regulations, Airbnb’s Cuban hosts can serve only American guests; users from other countries must make different arrangements. U.S. companies aren’t the only ones who stand to benefit from Cuba’s modernization. Countries such as Canada, China, and Venezuela have done business with Cuba for years. Cuba has already awarded contracts to the Chinese firm Huawei to install the DSL network equipment slated to go online by 2020, Press says. Huawei also supplied the equipment for ETECSA’s new Wi-Fi hotspots popping up around the country. And this year the country finally gave up its dependence on slow, costly satellite-based Internet connections. In July, Cuba moved all of its Internet traffic to the ALBA-1 fiber-optic cable running from Venezuela to the southeastern tip of Cuba. Despite these signs of progress, there are still some barriers in Cuba’s march to modernity. The biggest could be Cuba’s government. For one thing, labor in Cuba is heavily taxed, according to Richard Feinberg, a nonresident senior fellow at the Brookings Institution and professor of international political economy at the University of California, San Diego. In December 2014, the Cuban government announced that more than 90 percent of the income earned by an employee of a foreign company would be withheld by the government. “That’s a huge disincentive” to foreign investment, Feinberg says. It also leaves those Cuban workers with far less disposable income to spend on goods such as smartphones and laptops. There are also political considerations. President Raul Castro is due to step down in 2018. A leading candidate to replace him, Miguel Díaz-Canel, appears interested in modernization and in bridging Cuba’s digital divide. At the same time, says Press, there are elements within Cuba’s power structure that would rather not see the entire population gain easy access to the Internet. That’s why Cuba’s long-standing policy has been to rely on poor Internet access and a highly restrictive national intranet to prevent Cubans from interacting with the world digitally. Only now is that situation slowly changing. Meanwhile, the U.S. opening to Cuba depends on the next president and the Congress that takes power in 2017. If Democrats retain control of the White House and gain seats on Capitol Hill, they’d likely further ease the trade embargo, the Brookings Institution’s Feinberg says. If Republicans gain more power, however, they might not be so accommodating toward the tiny nation just south of Florida. So while everyday Cubans lining up outside hotels to get their quick hits of Internet access might welcome more and more openings to the world beyond the island’s shores, greater economic and political powers will decide if, when, and how that will actually happen. You can follow Ian Paul on Twitter.